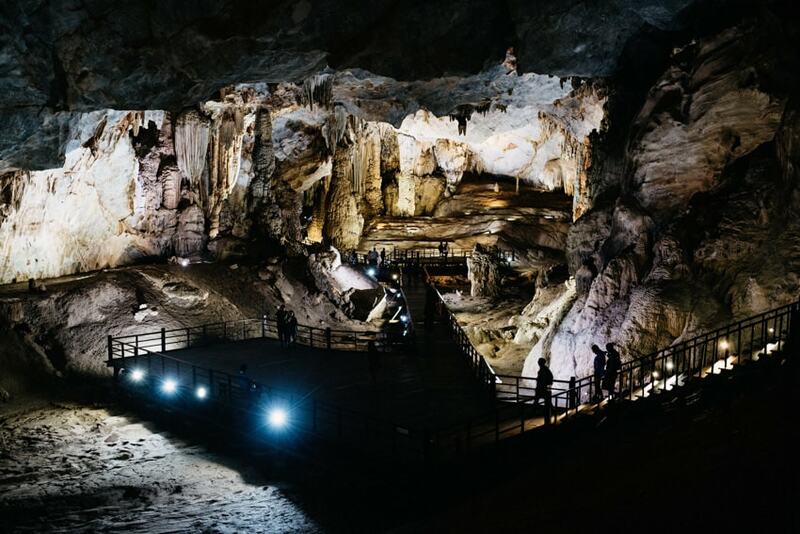 Phong-Nha Kẻ Bàng is located about 500 kilometres south of Hanoi on a very narrow spot of Vietnam (where the country is only about 50 kilometres wide – between Laos and the South China Sea). The National Park is famous for its extensive cave system that comprises over 300 caves. The area is one of the world’s largest limestone regions and large parts of the landscape are defined by karsts that formed about 400 million years ago. Because of the geo- and biodiversity, the park was declared a UNESCO World Heritage Site in 2003. 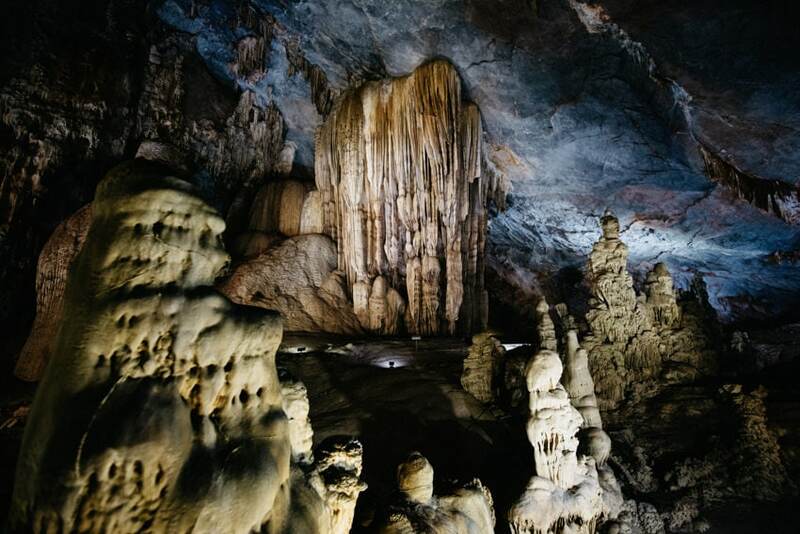 We visited Phong-Nha Kẻ Bàng National Park for 1 day to see the Paradise Cave and the Dark Cave. The national park features numerous caves that are open to the public and can be visited by tourists as part of either 1-day tours (e.g. 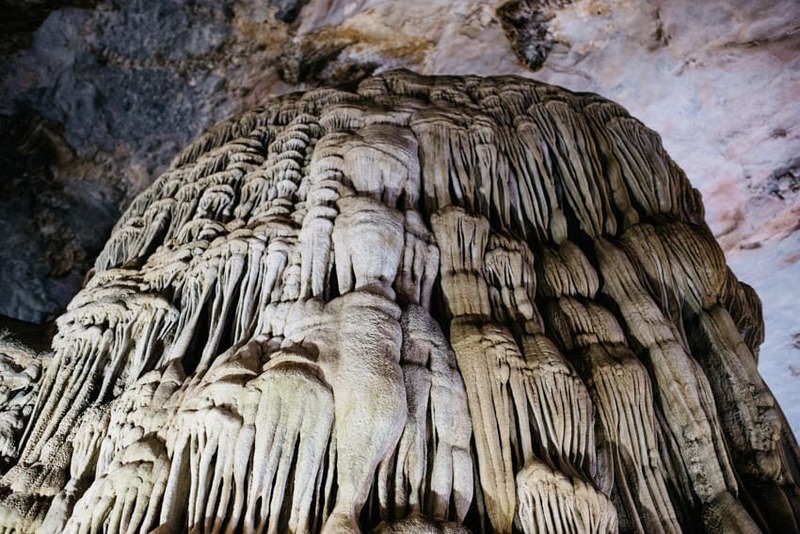 Paradise Cave, Dark Cave, Phong-Nha Cave) or more extended excursions. The longer tours lead further into the caves or even to caves that are remote and can only be explored by walking / hiking there. The tour operators basically all offer the pick-up from either Dong Hoi City or Phong Na. The reason we stayed in Dong Hoi City and start the tour there was that we arrived from Hue the night before and the bus ride to Dong Hoi City already took 4 hours. It does not really matter where you start the tour – choose the city that fits your personal travel schedule better. 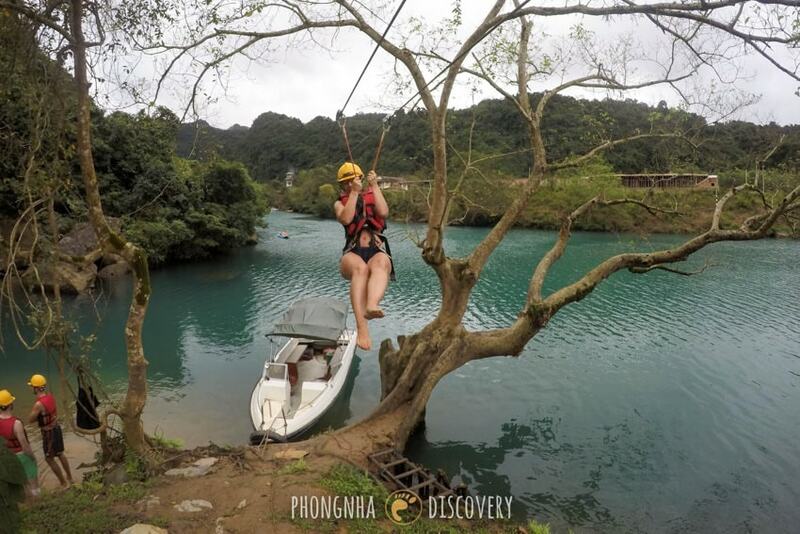 We did the Tour with Phong-Nha Discovery Tours. Tours in Vietnam do not really differ, the itinerary and the price are, most of the times, pretty much alike if not the same. 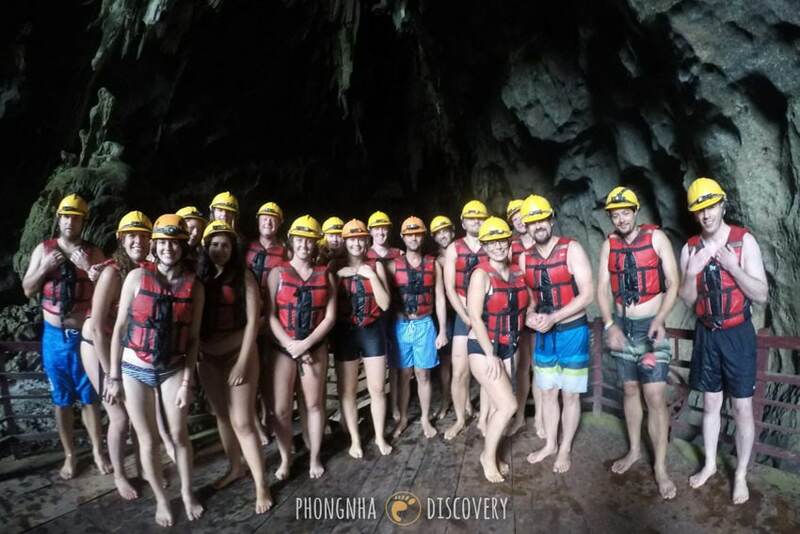 We researched a lot and after analyzing many tours, finding out they all offer the same tour for the same price, we chose Phong-Nha Discovery Tours. 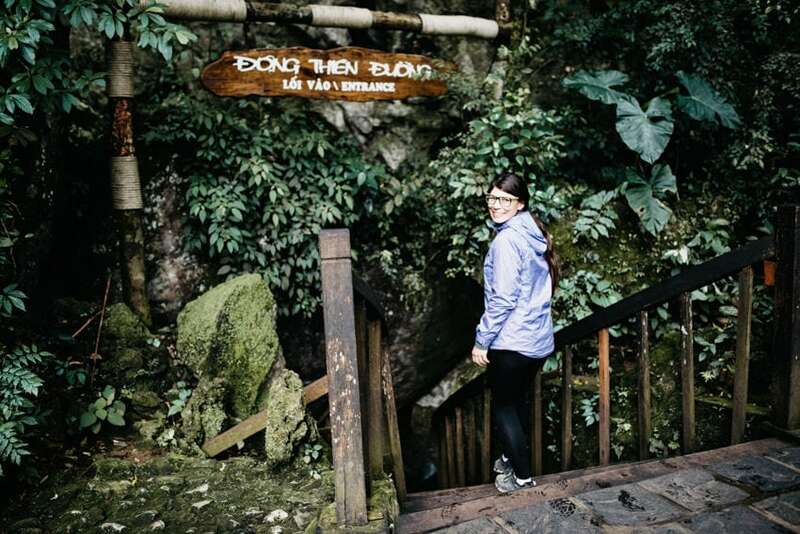 Every accommodation we saw in Vietnam offered all the tours in the entire country (you can even book a Halong Bay Cruise in Ho Chi Minh City), so if you prefer the more comfortable way, you can wait and have the accommodation book the tour for you. Still, we recommend to do some research because sometimes hotels / hostels offer more expensive tours. 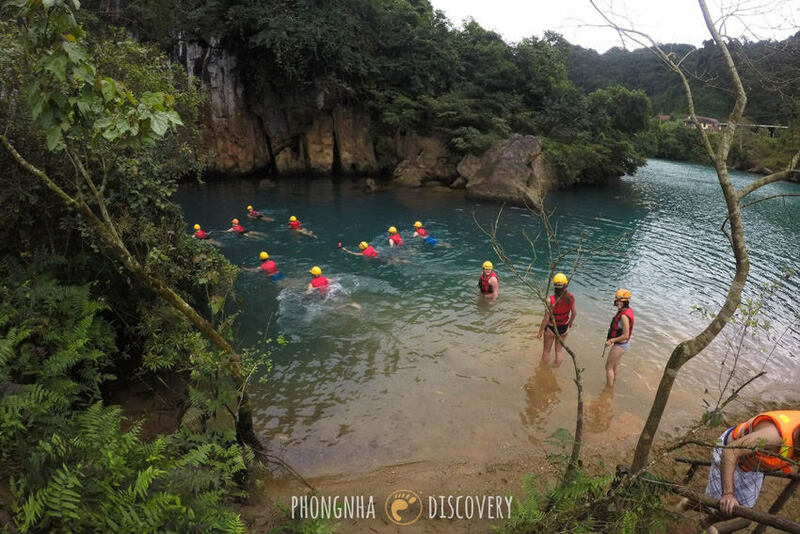 Phong-Nha Discovery Tours offers 1-Day Tours and multi-day tours – so, whatever experience you look for, they are likely to have the right offer for you. Originally, we wanted to stay at the Phong Na Farmstay, which also offers a bunch of tours to the National Park. However, the minimum stay was 2 nights and we only had time to stay 1 night, so, unfortunately, we could not do it. All the 1-Day Tours we found, cost 60 USD (+/- 5 USD) – it is not cheap but we think it was totally worth it. Offering: you can choose which caves you would like to combine in your 1-Day tour package (e.g. 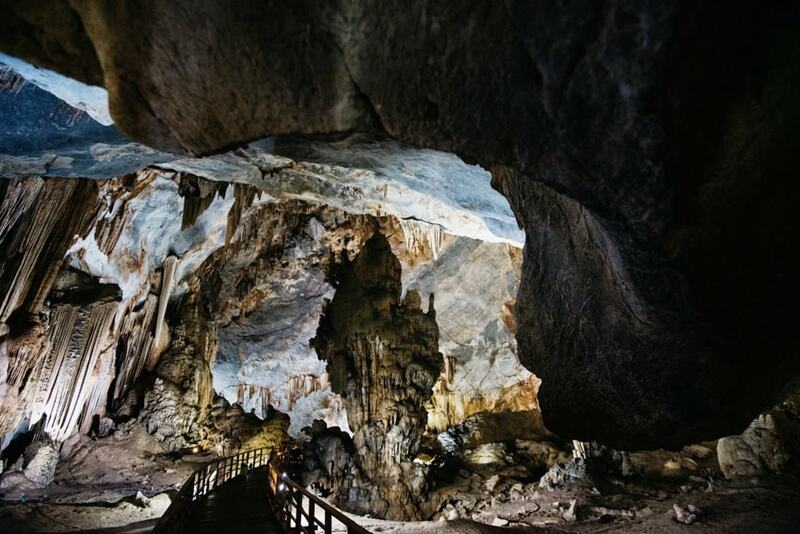 Paradise Cave and Dark Cave, Paradise Cave and Phong-Nha Cave, …) or you can just do a longer trek (e.g. Paradise Cave 7 km / 4 miles). Multi-Day tours are also available. We chose the tour package “Paradise Cave – Dark Cave” because we heard Paradise Cave is absolutely wonderful and because Dark Cave can only be reached via a zip line and some swimming and we expected to be less touristy then (which actually turned out to be true but it was still visited by many groups). We were picked up at 8:00 AM at our hotel in Dong Hoi City. We even picked up a couple at the train station (that arrived in Dong Hoi City with the night train) – which is a really good service. We left Dong Hoi City after the tour by night bus and they also agreed to drop us off at the bus station. After we had picked up all people in Dong Hoi City, we drove to Phong-Na to pick up the rest. The drive to Phong-Na takes about an hour and the drive from there to the Paradise Cave another 30 minutes. During the drive, we got to know our guide Tuyin (nickname: Chocolate) who explained the itinerary of the day and told us a little bit about the caves. Paradise Cave was discovered in 2005 by a local man when he was hunting in the area. With 31 kilometres (19 miles) in lengths, it is the longest cave in the National Park and the longest dry cave in the entire country. 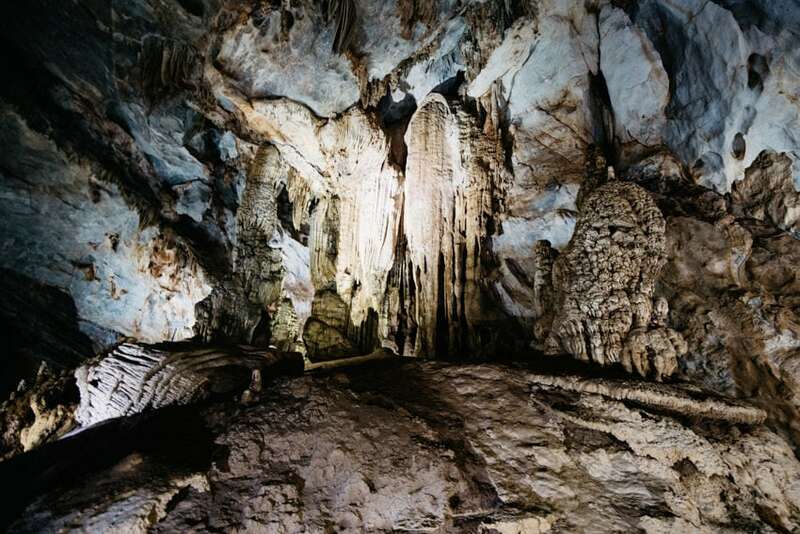 Until they discovered this cave, they considered Phong-Nha cave the longest in the park. 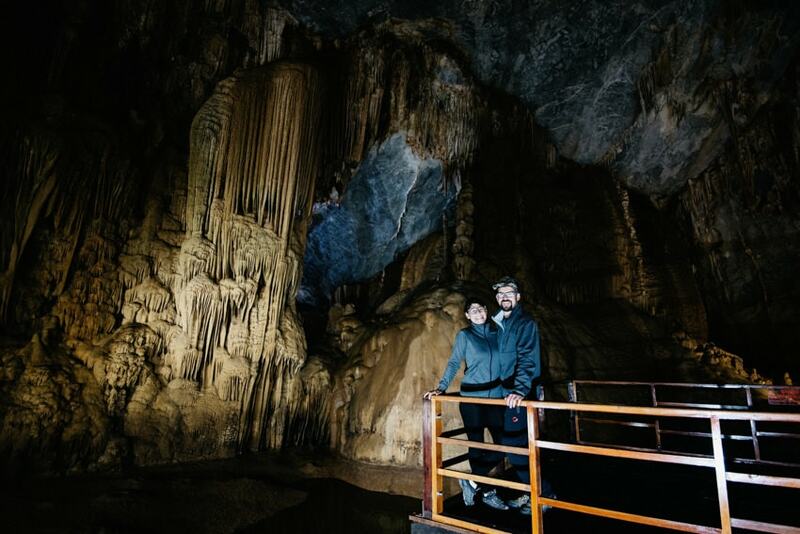 The Paradise Cave is accessible for tourists along a 1-kilometre footpath (0.6 miles), leading into a world of stunning stalagmites and stalactites. We had 1 hour to walk through the cave individually along the 1 kilometre footpath. It was so stunning that we almost couldn’t do it in an hour. The entire cave is wonderfully illuminated, and it is just absolutely amazing to walk through the cave with the huge stalagmites and stalactites to the left and to the right. Dark Cave is the adventure cave in the National Park. It is not visited because of its beauty – which is not really visible as the cave is completely dark – but for its adventurous way of getting there (400-meter zip-line and swimming through an emerald river) and its hidden treasure deep in the cave, a mud bath. Firstly, we got changed into our bathing suit. As it only had 15° Celsius (60 Fahrenheit) on the day we participated in the tour (it was in January which is basically winter and we were really lucky because, at least, it was not raining like hell), it was quite chilly. 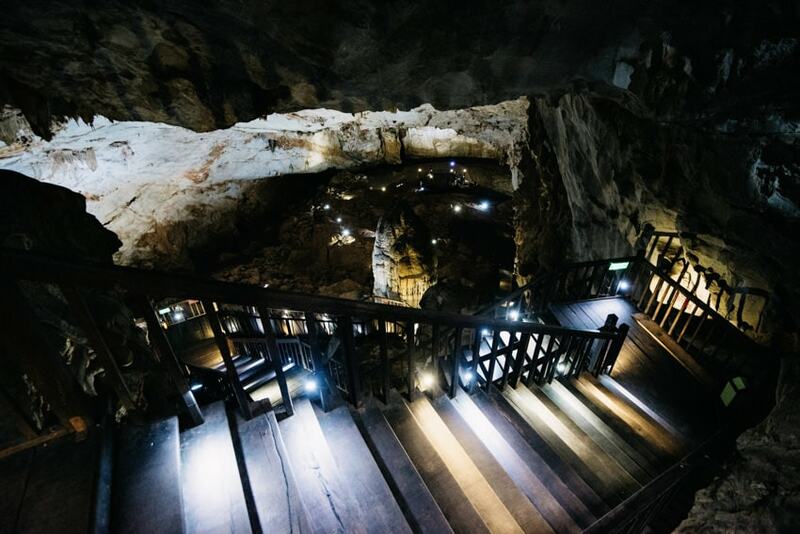 The first act in order to approach the Dark Cave is a 400-meter (1,300 ft) zip-line. It goes over the emerald river and is really cool. It was quite fast and offered a wonderful view on the water. After that, we had to swim through the river for about 50 meters (160 ft) max. Considering the quite chilly outside temperature, the river felt quite warm – with a temperature of approximately 22° Celsius (70 Fahrenheit) it was almost like a jacuzzi. However, the real spa experience is hidden deep inside the cave. After 700 meters (2,300 ft) of walking through water and climbing barefoot over rocks and mud hills, we reached the mud bath. We got to bathe in it for about 15 minutes and pampered our skin (our guide told us it was very good for the skin). After the bath, which was good for our skin but made us look like we had just taken a chocolate bath, we took another bath in the cold water to get rid of the brown mud. After that we had to kayak back to the other side of the river. There they have very fun water activity games, where you can jump in the water from a zip-line and other stuff, however, we were already deep frozen by that time and just got changed. In summer, it is a real outdoor paradise and definitely a lot of fun. At 5:30 PM we were dropped-off at the bus station in Dong Hoi City. We were really satisfied with the tour – everything was well organised and the stuff was very friendly, helpful and really tried hard to make us feel comfortable. We asked if we could be dropped off at the bus station instead of the accommodation and it was no problem at all. The booking process was really easy and the communication with the tour operator really good. If we had sent an e-mail with a question, they always answered within a very short time. Our tour guide also made pictures of us (group picture and pictures of us on the zip line) and they were uploaded to Facebook on the next day. So, we could download them for free – which delighted us a lot because usually you have to pay extra for these pictures. 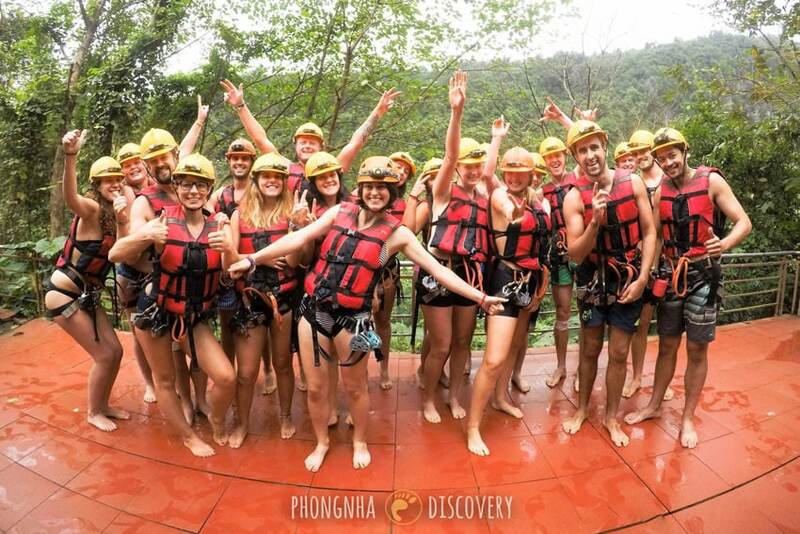 Overall, we were totally satisfied with the tour and do highly recommend Phong Na Discovery Tours. The group size was about 20 people – if you prefer a more private tour, this might not be the right choice for you though. We only spent one night in Dong Hoi City and therefore, were looking for a cheap and relatively centrally-located accommodation with included breakfast. We found the Nam Long Hotel on booking.com and booked it right away. The reviews were great and it turned out to be a fantastic choice. The hotel is not what we would call luxury, however, considering the price of 10 EUR (12 USD) per night for a double room the price-performance ratio was exceptional. We had a huge and clean room with a bathroom (the shower was in the toilet – or better, almost over the toilet but that is Vietnamese style). The breakfast was also great – the only negative aspect was that it took long (about 30 minutes until we finally got our yogurt with muesli and banana pancakes).